Though only a few thousand were sold last year, collision repairers might still want to take note of the 2015 Kia Sedona minivan — and its increased high-strength steel body — after recent developments. Kia announced Wednesday that the Sedona received a National Highway Traffic Safety Administration five-star overall safety rating and won five stars on pole, front- and side-impact tests. 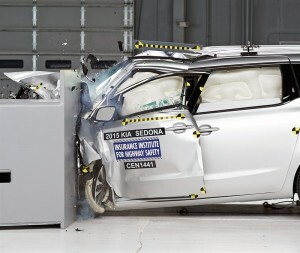 That’s more evidence for the safety of the Sedona, which in late 2014 was found by the Insurance Institute of Highway Safety to earn a “good” safety rating — the only minivan besides the Honda Odyssey to win that score. The Odyssey also was the only other minivan to win an overall five-star crash rating from the NHTSA. In fact, the two most popular minivans in the country last year (the Dodge Grand Caravan and the Chrysler Town and Country, according to GoodCarBadCar) — were regarded as “poor” by IIHS, as was the low-selling Nissan Quest. The Toyota Sienna was rated “acceptable” by the IIHS. All of these except the Quest, which so far hasn’t been rated by the NHTSA, received four stars overall from the feds. Also of note, the Sedona was the No. 5 minivan in the country in 2013, according to GoodCarBadCar — selling only a tenth of the top four, but impressively doubling sales from 2013 from 7,079 vans to 14,567. (The next biggest increase was the Town and Country, up 12.9 percent.) This year, Kia has already sold more Sedonas in three months than in all of 2013. OK, so there might be more of them trickling into your shop, and they’re safer. Those are good things, but why should you care beyond that? Well, the Sedona body that protected your customers probably did in part because it is now 76 percent high-strength steel — and some of this includes the subset of “ultra high-strength” press-hardened steel. These metals can’t be repaired the same way as you would with mild steel, as we also discussed with the increase in high-strength steel in Kia’s 2016 Optima. The minivan also is intended to spread impacts throughout the body — a concept discussed at a recent SCRS Repairer Roundtable — with ultra high-strength steel tubes in the A-pillars.